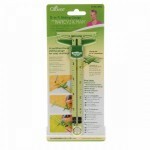 It’s called the 5-in-1 Sliding Gauge and it is the Swiss Army Knife® of sewing tools. Application after application, the list is almost endless. This is a true multi-function sewing tool that belongs close at hand in every sewing room. What does it do? – There are the advertised uses and then there are the ones you will discover on your own. We’ll be interested to hear from you to add to our list. Measure hem lines. The moving slider locks into place at 1/8 inch intervals up to 6 inches. Measure from the top of the “T” to the top of the locking slider for perfect hems every time. Mark seam allowances. The 5-in-1 has convenient markings for standard seam allowances or your set your own. Create perfect circles or arcs. The right side of the gauge is marked in inches from 0 at the pivot point up to 6 inches at the top. Hold the pivot point with Clover’s awl and insert a marking pin into the locking slider and set at the desired radius and swing for a perfect arc or circle. The “T-Square” feature of the 5-in-1 Sliding Gauge allows you to measure both length and width at the same time. 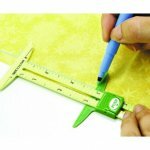 You can also use it to set perfect right angles in any sewing project requiring square placement. Space, place and size button holes. Use the space between the top of the gauge to the top of the slider to measure the length of your button holes. The same feature can be used to transfer the distances between button holes from a pattern to your garment or you can make custom settings as suits your design. 5 uses! Button hole spacer & sizer, seam allowance gauge,circle compass, hem gauge and 'T' gauge. See what you can do with this great tool!